The Account Setup Wizard is designed to guide new users through the process of configuring some of their online store's basic settings. The wizard introduces the user to the tools needed to get their store up and running. It's not meant to be an all-inclusive tutorial, it just scratches the surface of what what's available in Modular Merchant's shopping cart software. In the first step, the user selects which tools will be displayed in their administration area. This is determined by answering some simple questions about what their company does, and what their level of ecommerce expertise is. This step records some basic information about their company, such as their company's name, address and contact information. Products are the items that customers purchase in your store. This steps guides the user through configuring a sample product in their store. This step allows the user to customize the colors and layout of their store. There are many free designs are available to choose from in this step. Users can also make their own store designs, using standard HTML. There are a number of pre-made FedEx, UPS or USPS shipping options ready to use. Users can also add their own custom shipping rules. Users can configure a tax rule on this step. Taxes may be assigned by state, country, zip code, or any combination of those. In this last step, users connect their store to their credit card processor and/or their PayPal account. After this step is completed, the online store is ready for business! There are, of course, about a gazillion more options available for personalizing the Modular Merchant shopping cart software. 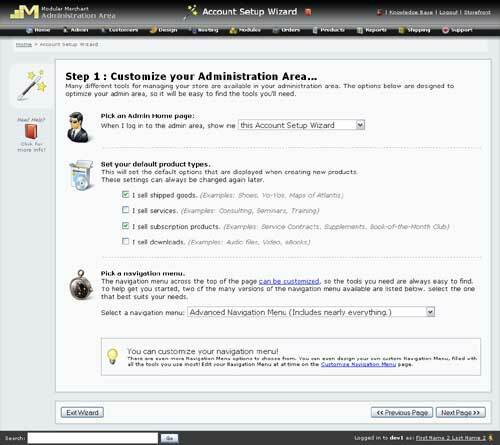 The Account Setup Wizard is designed to introduce the user to the essentials, and help get them started on their way!